If you’re getting married soon, there’s a chance you’ve already asked a group of your best girls to be a part of your bridal party. These girls are wonderful women who you have known for years, and maybe one in-law you’ve known for a few months. But, regardless of how long you’ve known your bridesmaids, they’ve made such an impact on your life. Enough of an impact for you to ask them to be a part of your special day. As a bride, you’ve probably gotten so used to being showered with gifts over the past few months. But now it’s time for a few other people to get something special. 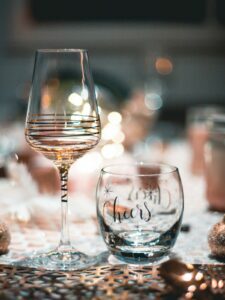 Typically, brides give their bridesmaids a gift on the day of the wedding, and if you’re struggling to think of what to give your girls, here are a few unique gift ideas your bridesmaids will love. Here’s something your bridesmaids will love to wear long after your special wedding day – stylish, white cotton nightshirts. These white sleep dresses are the perfect piece for those coveted wedding photos you and your girls will take while getting ready. Plus, they’re breathable and liberating, so your friends will spend their morning in comfort. After your special day, anytime your friend puts one of the white cotton dresses on before bed, they’re going to remember those special memories they had from wearing these special matching nightshirts. They might even be inclined to buy the same white cotton dresses for their bridesmaids in the future. Getting ready is fun with unique and memorable glassware. If you and your girls are experiencing the pre-wedding jitters, you’re probably all going to indulge in an alcoholic beverage or two. Typically, the bride and her party will sip on champagne while getting ready, but what about a Moscow Mule? They’re a unique drink and you can gift your girls with their very own Moscow Mule mug to drink out of on the big day. You can also have the mugs monogrammed for an extra special touch. It is a cute way to make the day more fun. Cheers to the beautiful bride-to-be and her special bridesmaids! Treat your bridesmaids to ultra-soft waffle weave slippers so their feet feel comfortable before the party begins! We all know how unbearable it can be to wear heels for hours at a long wedding. These soft slippers will be perfect for your bridesmaids to wear while getting ready. The amount of time your bridesmaids will spend getting ready and helping you look your best will be worth it, and these slippers will just make running around that much pleasurable. 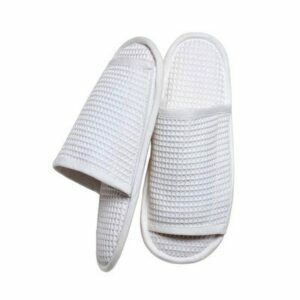 Open-toed or close-toed waffle weave slippers by Jacaranda Living are available, and special monogramming upon request! Your girls and their feet will thank you. 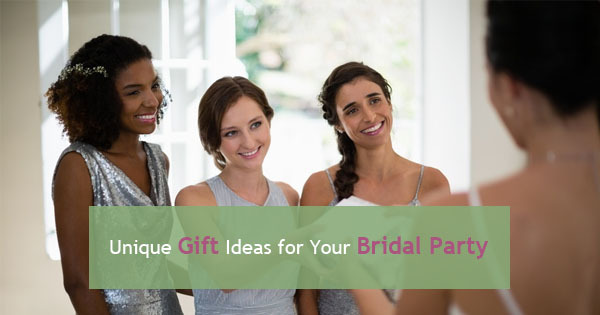 If you’re looking for a gift for your bridesmaids that’s a bit unique, take a look at the suggestions above. Hope they help you and your best girlfriends enjoy the party that much more! Lightweight, comfortable cotton pajamas will make you look and feel lovely. Pair them with some high thread count cotton sheets, and you will never want to leave your bed. 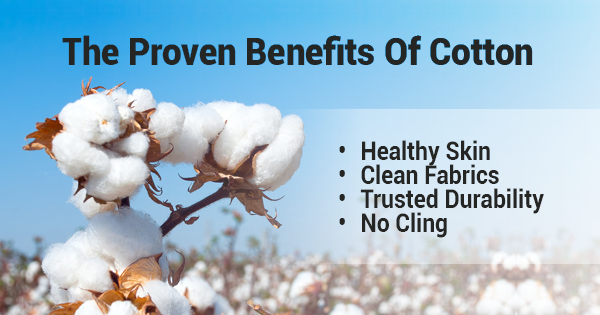 Remember that it isn’t just your skin telling you that you should be sleeping in cotton, but there are science-backed reasons that sing the praises of this fabric. Whether your daughter prefers a more simple style or an elegant dress with ruffles or lace, be sure that she will be comfortable all day long in these extra soft cotton dresses. 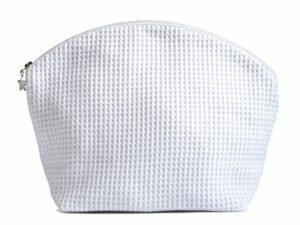 Healthy Skin: A study by the Sleeping Council found that cotton allows your skin to breathe and doesn’t trap sweat. It is also less likely to scratch and irritate the skin. Clean Fabrics: Cotton does not trap oils and odors like other fabrics, so you can feel fresh and clean while sleeping in your favorite pajamas. And when you do wash them, they are easy to care for. Trusted Durability: The material of cotton is strong, as the fibers bind together well. This is especially true for fabrics with higher thread count, so always opt for quality. No Cling: You won’t have to worry about waking up surrounded by static cling. You can slip out of bed as easily as you slipped into it. The Amy nightie is beautiful, soft to the touch and perfect for women of all ages. When you slip on your white cotton nightgown or white nightshirt at night, you know that it is time for a restful evening and luxurious rest. By choosing sleepwear made from high quality cotton, you can truly enjoy all the above cotton benefits. It is also important to consider the fit of your pajamas, as you want them to hang loosely without falling off. By keeping these factors in mind, you can select the best cotton sleepwear for your needs. 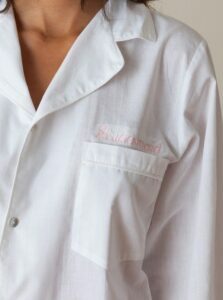 The Ally white cotton nightshirt is the perfect option for sleeping or lounging around the house. There is a reason that white cotton nighties were a favorite for Victorian pajamas and are still used today. Resting in your white cotton nightgown will help you feel fresh and rejuvenated, transforming your nightly ritual into something more beautiful. Once you buy a pair of cotton pajamas for yourself, you might just find yourself buying them for everyone else. 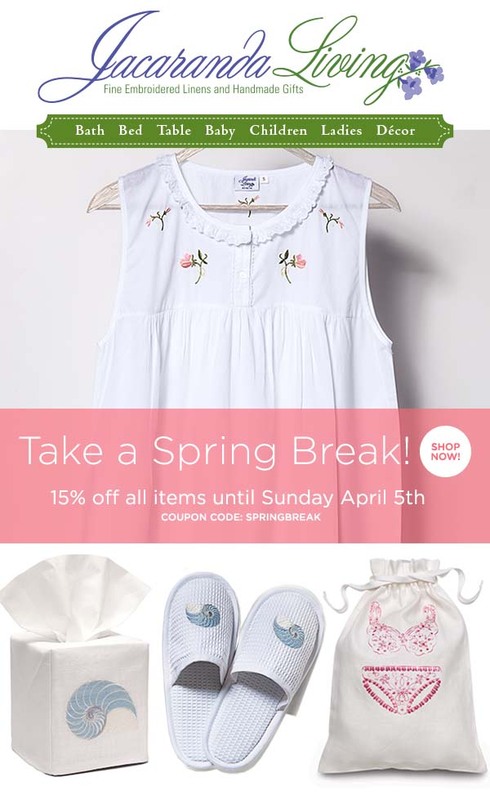 Enjoy the perks of our cotton, and shop now for you, a friend, grandmother or mom. They will enjoy them for years and years to come. We finally had the first weekend of summer last weekend, and the weather couldn’t have been better! It’s important to spend your weekends doing what you love because that is the time to yourself for rejuvenation, reflection and recuperating from the long work week before. For the upcoming Fourth of July Weekend, I’m sure everyone is preparing to pack for the beach! Here is a list of our favorite things from Jacaranda Living that are essentials when headed out to get some sun. 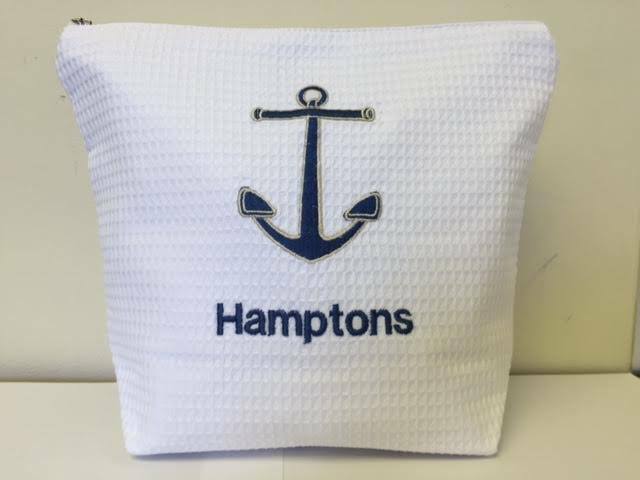 If you’re headed out east, don’t forget to bring your own Hamptons embroidered cosmetic bag to store all your personal belongings. 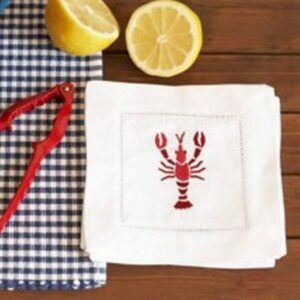 Pick from all our beautiful nautical designs to get your custom monogramming! 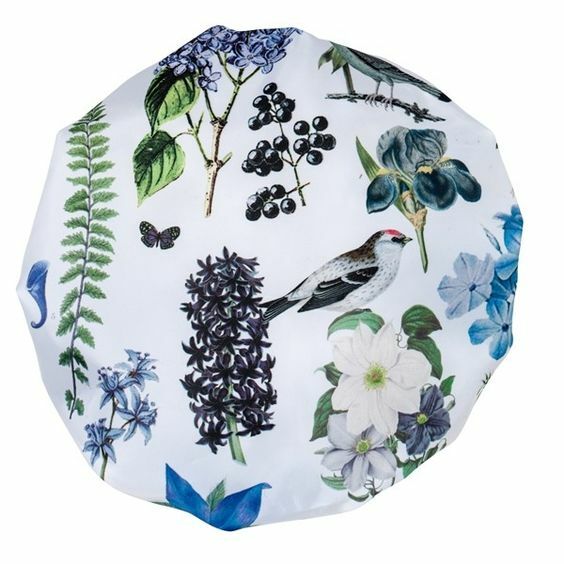 Pack your Moody Blues shower cap to keep your beach hair dry and looking fabulously wavy! 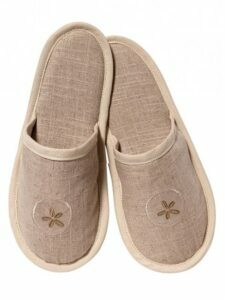 These are perfect natural linen slippers that are easy to slip on after a sandy day at the beach. 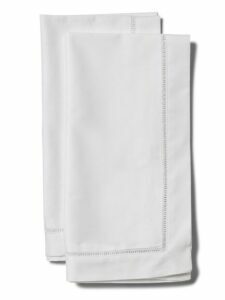 They are also great for travel as they slide into each other and roll up into any slot in your bag. Order a pair for you and a friend who may be hosting you for the long weekend! 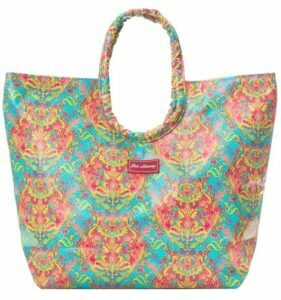 Don’t jet off to the beach without the right waterproof beach bag! 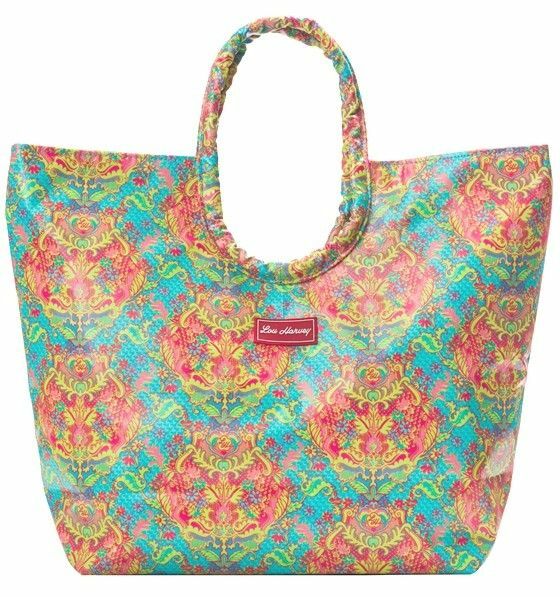 Our Indian Summer tote bag from Jacaranda Living will hold all your precious belongings, like sunblock and a large beach towel, while you’re wandering the sites or walking on the sand. Have a wonderful long beach weekend, and happy Fourth of July! Celebrate in style with our beach picks from the summer collection at Jacaranda Living. Today, with advances in medicine, premature babies have an ever increasing chance for survival. It’s not uncommon to hear, “we don’t care what the baby is, as long as its healthy.” But there are many babies today born too early, and they are still very much wanted, and loved. If a premature baby has arrived in your life, there are gifts that can help baby and mother/father bond, and give an added boost for stability and development. Take that extra step and give a gift of thoughtfulness the new mother will appreciate. But what about when baby comes home? Is skin-to-skin still important? At feeding time, skin-to-skin care can help! Skin-to-skin care can also assist at home for babies who have trouble relaxing and settling at feeding time. For both bottle and breastfeeding, skin to skin can help them gain a sense of security and assist in transition them to the sucking action needed to latch on and feed appropriately. Tummy-time can be mommy or daddy and baby time. “Tummy Time” is also an important part of a baby’s development. According to babygooroo, this time spent each day can assist babies in developing healthy tummy structure, and neck muscles. The good news is you don’t have to just leave the baby on a blanket on the floor. Get involved in tummy time by letting baby lie on your tummy. Jacaranda Living’s Carly Nightgown with button front, and our full line of embroidered pajamas are perfect for a relaxing, or not so relaxing day spent with a new baby, and plenty of tummy-to-tummy time. They’re a perfect choice for a new mother, or mother-to-be. Whether baby is full term or premature, comfortable, embroidered cotton sleepwear is a special treat mom will enjoy immediately because of the flexibility it offers for spending time with the new little one in her life. She’ll also appreciate it later on, when looking for something to relax in for a much-needed night’s sleep! Pretty enough for every day! Some of our pajama tops are even cute enough to wear as a cool summer top! Preemie Daywear – What’s best? Premature babies can have difficulty with body warmth in the early weeks. While the NICU will provide for them, once a small baby is home, making sure to provide comfortable, warm and safe clothing is important. Too warm is not good, but choosing a light fabric and being able to layer is a good idea. Consider the benefit of natural fabrics like cotton which is soft, and breathable and ranked among natural fabrics as the best for babies. 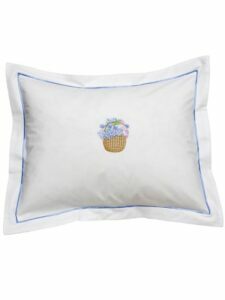 Cotton is washable, and comfortable for little ones to snuggle down in. Another recommendation included on babycenter.com is avoiding ribbons, strings and ties. These can present a choking hazard for infants. Baby Sacks from Jacaranda Living are a perfect choice, with no strings or ties, and an elastic bottom to keep tiny feet warm, but allow for movement and air circulation. Perfect for newborns to wear all day! They also offer mitten cuffs to keep baby from scratching himself. In a variety of embroidery options and matching accessories, including onesies, booties, hats and bibs, these are a great baby shower gift or welcome home surprise! Booties are a great way to keep baby’s feet warm but give you flexibility when temperatures change. It’s easy to remove booties (your little one will probably find that out quickly! ), when you’re outdoors on a warm day, but to put them back on in air-conditioned spaces. Taking a walk on a sunny day with a bit of a breeze can be comfortable for you, but perhaps a bit too chilly for naked baby feet. According to Footfiles, infant socks, or booties can help with fussiness, difficulty sleeping, decreased appetite and poor weight gain! A simple item of clothing can make an obvious difference! So, consider our wide range of booties as a perfect option, for you or someone you know! Tis the season for trade shows and business trips. Are you a packing tips pro? If not, these packing tips may be just what you’re looking for! Websites abound that provide a list of packing tips and essentials. Scan through and you’ll find that most contain the same information. The following list inspired by Travel Fashion Girl’s site is a good starting point. Survival kit – Lip balm, ear plugs, eye drops, moisturizer and hand sanitizer. 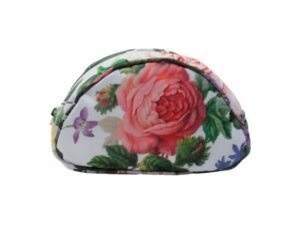 Fit great in our small Cosmetic bag to throw in a backpack for easy access. A scarf/shawl –to cover up when its cold or you’re traveling to a more conservative destination, or dress up a basic outfit. Small Purse – The large bag is great at home, but less is more for business travel. A small purse works for dinner meetings, evenings out, and makes finding important items, like IDs, cash, cards, etc. much easier. Phone charger –There’s nothing worse than getting stuck without your phone! Jeans – If okay for business travel, a nice pair of skinny jeans (or straight cut/trouser cut) work well with ballet flats or tucked into a sturdy pair of nice boots. Wear them on your travel day to avoid carrying/packing bulky items. Drapey overshirt/tee –Provides coverage when you’re bending, stretching and crawling over the guy who’s sitting in the aisle seat. It also layers great under a sweater or jacket, and can be dressed up with a scarf! Jacket/Sweater – Find something comfortable and light enough to wear for warmer weather, but also something that can give a casual look a bit more polish. Select a neutral color like black, navy, grey or tan. Scarf – A definite must for travel. It’s the one item you’ll always use: as a pool cover up, additional coverage in countries where shoulders, heads, or other body parts must be covered. It can also double as a picnic blanket, or a dressy shawl for a night out. Select a pattern and color that go with the rest of your minimized wardrobe. Hint, hint, you should have a color palette and try to make all pieces you pack work together! Shoes – The lighter the better, but don’t pack too many. If you’re doing a lot of walking, go with something comfortable and supportive. But consider wearing them on travel day, rather than packing them. Don’t forget a dressy look if you’re going out, but if you’ll be on your feet all day skip the stilettos! Travel day can turn into travel night in a heartbeat if planes get cancelled or delayed. Wearing clothing that can do double duty on your way to your destination is always a good idea. The best way to pack wisely for a quick business trip is to know what you’ll be doing, and select clothing that falls into a color palette that works together. Then choose clothing that does double duty. Wear bulky or heavy items, and stay away from items that wrinkle easily, or won’t stand up to a full day of wear. Don’t forget medications, and personal items, and if you travel frequently consider keeping essentials packed and ready to go at a moment’s notice. It takes the stress out of last minute packing, and forgetting important items. Having everything packed ahead of time gives you the time you need to prepare work related items, papers, and technology so when you arrive at your destination you’ll be ready to go! Packing Tip! 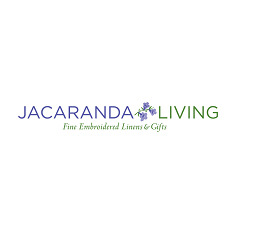 Jacaranda Living offers a variety of cosmetic bags, sling bags, and weekender bags that are perfect for a quick business trip, and add style to your business look. Whether you’re celebrating an empty nest, an autumn wedding, or just extending a homecoming celebration because you want to, girls’ getaway weekends are the perfect way to kick back, relax, and let your inner circle know how much you appreciate them. 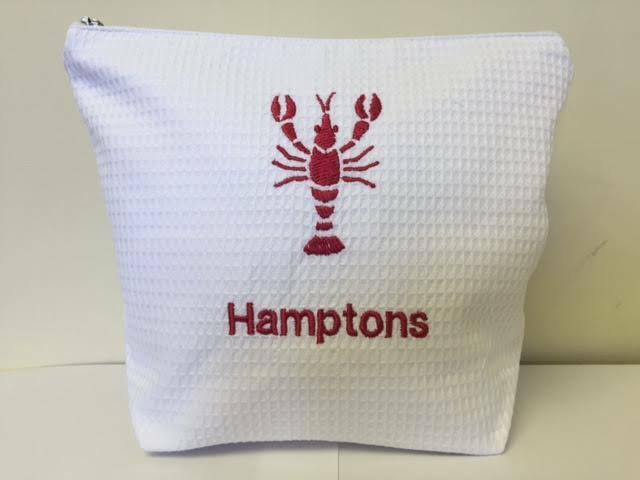 A special gift to commemorate your weekend getaway; a matching nighshirt or scuffies for poolside, or even a cute cosmetic bag can be a reminder of a fun weekend away, and let your friends know how much they mean to you. Abby Draper of The Huffington Post’s Blog reminds us, “every woman needs a good ‘girls weekend’ every so often.” The one thing all the above ideas have in common is a shared history or experience among the guests. If you’re the weekend planner, don’t sweat. It doesn’t need to be a “destination weekend” and can even just be a slumber party in your own neighborhood, as long as everyone is getting away from home, work, and a break from the norm. A great way for parents and loved ones to help with that “staying connected thing” is a care package from home. Look for snacks, photos, and dorm room decorations to include in a care package. Consider mugs, toss pillows, and even a comfy blanket to make all the difference. Having a warm, welcoming room to come back to after a long day of classes, or to hunker down in when a new student is suddenly down with a cold and far from the comforts of home, can make all the difference in the world for seeing a new way of life in a positive way. HGTV recommends keeping the size of a room in mind. There isn’t a lot of space for furniture and additional storage. But simple things like toss pillows and comforters can give the room a welcoming, “hug-from-home” feel when its needed most. Coordinating colors can be tough with a roommate or two, but items in a neutral palette can work perfectly. And something as simple as matching toss pillows can be a sweet “getting to know you gift” that can also make a room more comfortable. Winter is Coming Package – If your child is a Game of Thrones fan, they’ll get a kick out of that message, but include mittens, hats, scarfs, and even a lightweight comforter that’s large enough for a few friends to snuggle under as they talk the night away. Cute pajamas or a comfy personalized robe also make a great gift for those sharing a bathroom with others. Cute pajamas or a simple cotton robe are the perfect thing for those students who may have to share a bathroom with new roommates. It can be tough for kids and parents during that first semester or first year away. Everyone is getting accustomed to a different life. Loved ones you’ve seen day in day out for years are now suddenly building their life without you. You may get teary phone calls, not hear anything for weeks, or have a college student anxious to come back home for a visit as soon as possible. It’s all part of the adjustment phase. Rather than supporting the tears and the visits, provide support for the child to remain at school. Greatergood.com recommends supporting your child with self-compassion and kindness. Help them accept that “their difficult feelings are part of the universal experience of leaving home.” Get them to talk about how they are feeling and encourage them to get involved in activities on campus. Set goals to explore one new place a day, or meet one new person a day. Soon they’ll feel far more at home at school! Then it will be your chance to adjust. A first year away from home can be tough. Knowing that family is still thinking of you, and having small items around that provide the comfort of home can make a huge difference. Little items like toss pillows, blankets, mugs and a favorite stuffed animal can make a dorm room a cozy refuge when the world seems a bit too strange to handle all at once. 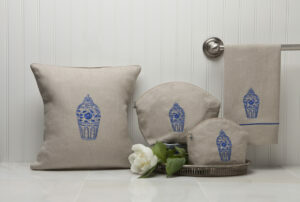 Jacaranda Living has embroidered toss pillows, robes, and other items perfect gift for a new college student. They offer comfort when college life gets overwhelming. 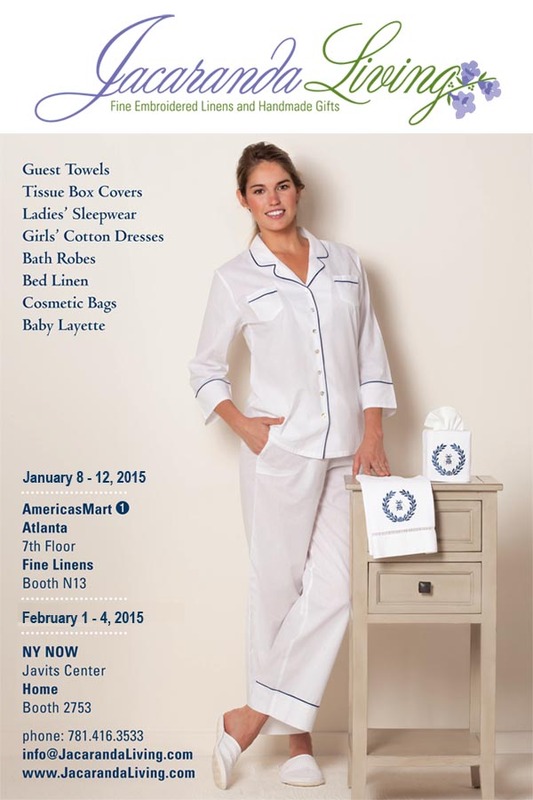 Come see us at NY Now from January 31-February 4th! 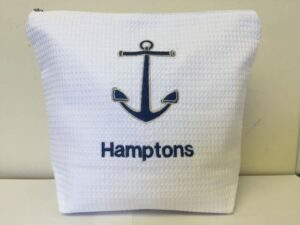 We will be showcasing our most popular products and some of our newest products, including terry cloth towels, new embroidery designs, and more! Stop by booth 2753 in the Home Section of the show to come see us! Use this map to help you navigate all the vendors. 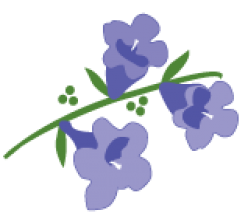 Format ImagePosted on January 22, 2015 February 14, 2017 Author Jacaranda teamCategories Gift Shows, Gifts for Baby, Gifts for Her, Holiday GIfts, Home Decor, New Product Launches, Terry Cloth Towels, Waffle Guest TowelsTags baby gifts, ballerina embroidery, bedroom decor, custom monogramming, embroidered linens, embroidered waffle towels, gift shows, honeymoon nighties, NY Now, perfect white nighties, white nightiesLeave a comment on NY NOW!